Having missed the first staging of this German folklore-based play, I was very keen to attend the show when it was staged yesterday (27th October 2009) as part of the Ranga Shankara 5th anniversary celebrations. It was indeed heartening to see the enthusiastic lineup of children just before the play, and I was also impressed that Sankar’s Cafe at Ranga Shankara also has a Readng Corner for children now. 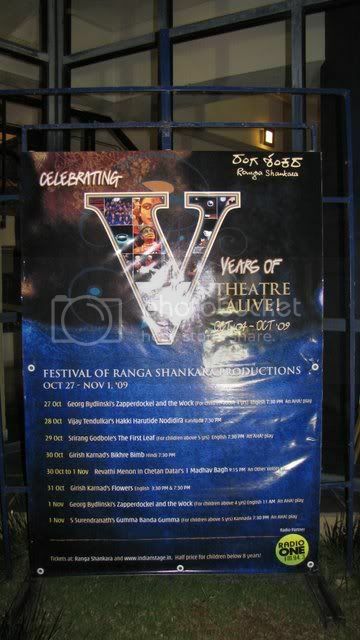 Theatre and allied activities seem to be actively encouraged at Ranga Shankara and this is a great thing to see. “Zapperdockel and the Wock” is the story of two very different creatures, Zapperdockels being small, and the Wock being a very large being. A Zapperdockel is also a crybaby.How these two interact and learn to get along is the story of the one-hour play. Throughout the play, I was impressed by the reaction of the children in the audience (the play blurb says it’s for children “4 and above”.) A crowd of them were also invited on to the stage, and they were clearly enjoying themselves. Virginia and Anil Kumar (I don’t know if I got the male name right, though) were the puppeteers who brough the puppets to life, and with innovative props, excecuted a variety of tricks and capers on stage that had the children constantly amused, and, occasionally, enthralled, as when they lit a flame under a plastic bag, and sent it soaring up into the air. Walking sticks that acted as scales, hats that filled with flour, a box that opened this way and that…the props were very inventive and creative, and the rectangle described by the ropes onstage created a stage within a stage where all the action happened. I thoroughly enjoyed the music, too; it was composed by Kumaresh of the famous violinist duo, Ganesh and Kumaresh, and sometimes consisted of purely Carnatic renditions, sometimes percussion passages, and sometimes a violin duet…it was a delight to the ear at all times. The puppets, made by Anurupa Roy of Kat Katha, were also lovely to behold, with several Wocks taking the stage at one time, but mostly having a blue-coloured Wock iinteracting with a littleyelllow Zapperdockel. However, I must say that perhaps I was too old for the narrative: I could not follow the thread of the story too well, and sometimes it seemed to drag. Some of the tricks on stage seemed to really have nothing at all to do with the play at all..though perhaps, with the age of the audience tragetted, no such connection was necessary. I never felt that I had got the message that Aru gave the children just prior to the show…that the play was to show how different people can get along together. 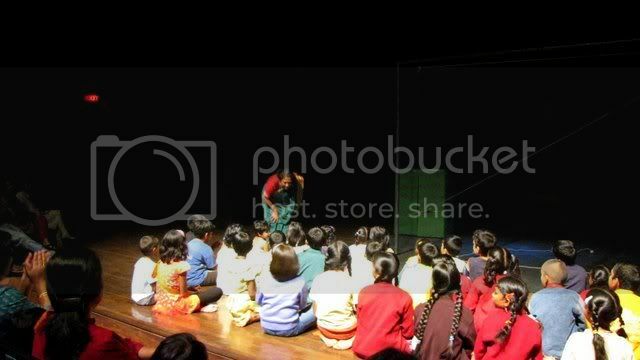 I would like to make the point, however, that young children need not always feel that magic-type tricks and slapstick comedy are the only things that comprise theatre for children; I think they are capable of appreciating more sophisticated storylines and stagecraft than what I witnessed at Ranga Shankara yesterday. Personally, I felt that the play could have been cut short to even 40 minutes, and could have done with a more predominant, sequential thread running through it. The two Sutradhars did not always seem to have a “sutra” to convey to the audience. All the plays have been staged before, but are being brought back by popular demand. DRAMANON presents “SIC” : An English Play at Alliance Francaise on October 24th 2009.
aspiring auctioneer. See them humorously trudge through the haunting morass of everyday drudgery and the biting emptiness of big city life. Watch, as the three of them come together to discuss, flirt, argue, share their dreams and plan their futures with unequal degrees of deep hopefulness and abject despair. [sic], chosen as one of the Best American Plays of 2002, is a neurotic, bittersweet comedy about the “quarter-life crisis”, and unfolds as three lives collide in one common corridor. atre Jam is a space to affirm individual expression. we are a caravan of artists who meet every month to share, create and JAM. and now, we ask the whole city to join in! in public spaces of Bangalore. make theatre jam, your space. anyone can Participate in the jam activities. pick a date in October and tell us what you want to do. most activities will take place in public parks, streets, terraces, basements and markets. spread the word and encourage more people to participate in the october jam. Art, a French play written by Yasmina Reza, adapted in English, by Christopher Hampton, is a play, that revolves around three diverse and minimalist products of human nature. Three characters, aesthetes in their own right, questioning their individual prejudices against each other. Serge, a modernist, a puritan, but an afterthought of delusion. Marc, characterized by the epitome of self-acclaim and classicist snobbery and Ivan, an oblivious leaf, which flows in whichever direction the wind blows. The three friends collide subtly into each others’ perspective and push each other into an overwhelmed sense of egoistic urge towards moral self defense, bringing out the extremes of human nature in the most sublime of ways. The simplistic portrayal of a relationship severed at the seams, encompassing Art as its supposed to be, universal and conflicting.